With emerging data from the United States Centers for Disease Control and Prevention showing that food allergies have been on the rise since 1997, more parents than ever are facing the scary prospect of sending their children to schools where contact with common food items could mean dangerous or even fatal allergic reactions. Fortunately, the rise in food allergies has brought along with it a rise in awareness and precautions in many public school systems. These are a few of the ways you can keep your allergic youngster safe while he gets the education he needs. Discuss the Matter with Teachers and Administrators – The first step towards ensuring your child’s safety and wellbeing at school is to set up a meeting with his teacher, school administrators and any school nurses on staff. Take the opportunity to explain your child’s allergy, the level of severity and your existing plan of action in the event of allergen exposure. In some cases, this initial meeting can be enough to get the ball rolling, and you may find that your child’s school is quite cooperative with his needs. Chances are your school has a formal protocol for managing student allergies. Teach Your Child Never to Share Food – While telling a small child not to share something flies in the face of every lesson you’ve ever attempted to teach about the virtues and importance of sharing, it’s essential that he understands how serious it is for him to never share food. Even if a snack or meal appears to be nut free, without reading the packaging your child will not be able to successfully determine whether or not it’s been processed in a shared facility or if it came into contact with tree nuts at some point along its journey. Coach Your Child About Reaction Symptoms – Every allergic reaction will have its telltale early symptoms, and your little one needs to be well-versed in how to detect and recognize them. This especially holds true for kids who are easily distracted or who don’t take their food allergies seriously enough to be diligent about avoiding exposure. Make sure he knows the first symptoms of allergen exposure, as well as how he should proceed after identifying an impending reaction. Provide Him With the Vocabulary to Communicate Possible Reactions – Older kids who have lived with their allergies long enough to understand them may not have as much trouble communicating the possibility of an allergic reaction, but small children will need to be carefully coached. Make sure that you’re providing your child with the vocabulary he needs to let a teacher, administrator or nearby adult know that he’s suffering from the early signs of anaphylaxis or even a mild reaction. Provide Auto-Injectors to School Administrators – If your child’s pediatrician recommends that you keep auto-injectors on hand to help mitigate the effects of an allergic reaction while waiting for emergency medical attention, it’s important to ensure that the school has a few on hand as well. The school nurse, all teachers and office personnel should have quick, easy access to auto-injectors so that your child is able to obtain potentially life-saving intervention if he’s exposed to nuts. 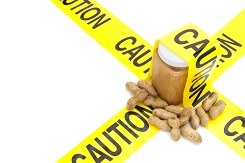 Research Peanut-Free Schools – While peanuts are legumes and not technically tree nuts, there is still a relatively high number of kids suffering from debilitating or even life-threatening peanut allergies. As a result, some schools have begun to institute “peanut free” policies. Looking for schools in your area that have such policies may be your best bet, especially if those schools are also maintaining a ban on tree nuts, as well. Consider Homeschooling – Though it’s certainly not feasible for every household, sometimes the most effective method of keeping highly allergic little ones safe until they’re old enough to thoroughly understand the dangers of their allergy is to teach them at home. You’ll be able to keep your child in an environment that you know is safe without jumping through administrative hoops. Older kids who are the victim of bullying due to their allergies may also prefer this learning environment.